This newly emerged Cercropia Moth, the largest species of Lepidoptera found in North America, was photographed at the home of my new friend Christine. She lives on the backshore of Gloucester and, with her friend Jane, who lives on the opposite side of Gloucester in the Lanesville area, are trying to repopulate Cape Ann with several species of the stunning and charismatic moths of the Saturn Family. These include the Cecropia Moth (commonly called Robin Moth), Luna Moth, and Polyphemus Moth. Where formerly abundant, these most beautiful members of the native Giant Silkworm Moth group of Lepidoptera are at extreme risk of becoming extirpated (extinct from a region). 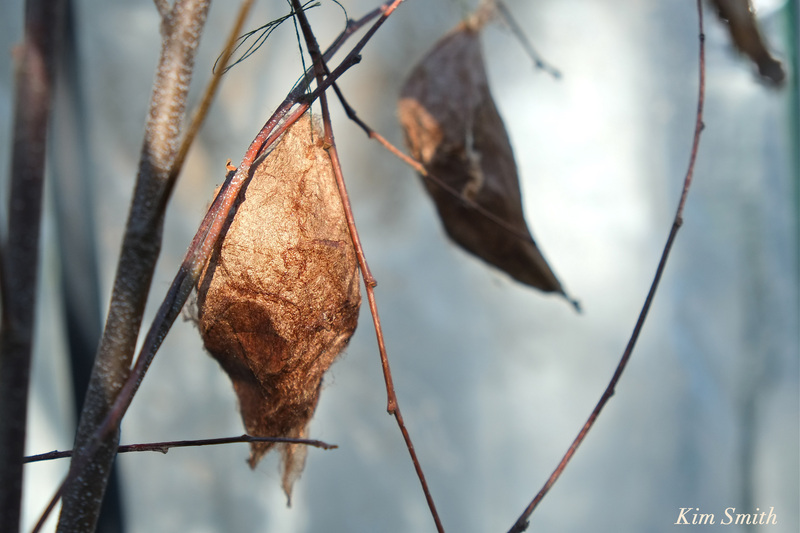 Christine recalls a time when she could easily find the cocoons in her neighborhood. Now she finds none. The reasons for their decline are severalfold; loss of habitat, the poison in the pesticides sprayed on trees is highly toxic to all insects, and because they are suffering from a parasitism by a tachinid fly (Compsilura concinnata) that was introduced to control the Gypsy Moth. Each and every person on Cape Ann can help these moths make a comeback by making a commitment to not use pesticides and herbicides, for any reason, ever. Christine and Jane purchase the cocoons at Magic Wings in Deerfield, MA. 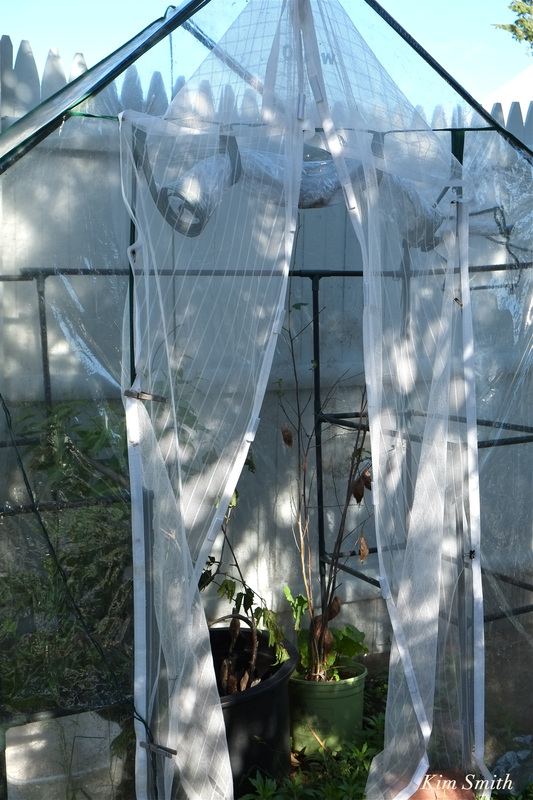 They place the cocoons in the screened butterfly house where they have also placed branches of the caterpillar’s food plant (in this case, birch branches). Cecropia Moth caterpillar food plants include the foliage of maple, birch, ash, apple, cherry, and lilac. If both male and female are present, they will mate almost immediately, within the first day or two, and the female will begin depositing eggs soon after. She releases the eggs on nearly every surface within the enclosure, dozens and dozens of eggs, up to 100! 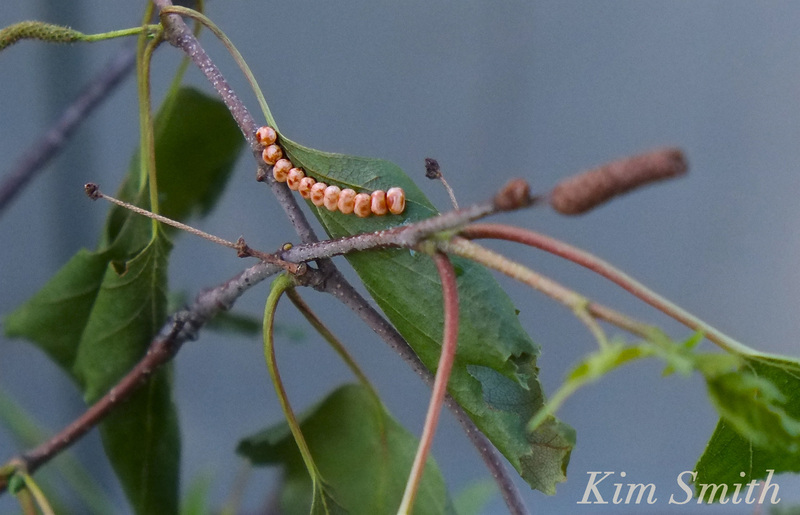 If the eggs are viable, within several weeks, the caterpillars will chew their way out of the egg casing and begin to eat the caterpillar food plants provided. Perhaps like Christine and Jane who, moth by moth, are trying to save our native Giant Silkworm Moths, you’ll be inspired to raise these North American beauties, too! More photos to come if a batch of caterpillars emerges. 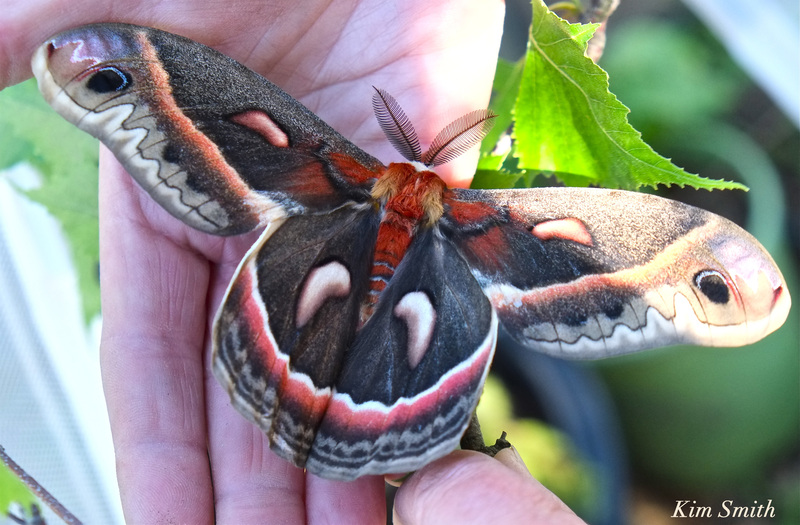 Stunning Cecropia Moth, landed on my sleeve and warming its wings. This entry was posted in Gloucester Massachusetts and tagged Cecropia Moth, Cecropia Moth Cocoon, Cecropia Moth eggs, Giant Silkworm Moths, Hyalophora cecropia, Luna Moth, Polyphemus Moth, Robin Moth, Satrunidae, Saturn Moth Family, Subfamily Saturniinae on June 12, 2016 by Kim Smith.